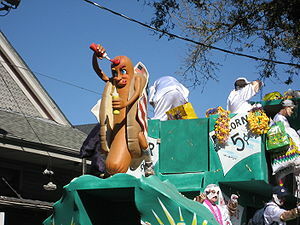 Hot dog float in the Thoth parade on Magazine Street during New Orleans Mardi Gras in 2007. Hot Dog Days are informal events that are celebrated in communities throughout the hotdog-eating world, including the United States, Canada, Great Britain and Australia. Their origin is obscure. As the name suggests, the festivals revolve around eating hot dogs, but usually there are many other activities such as wiener dog races, root beer chugging contests, and face painting. Often the proceeds from a hot dog day are given to charity. Industry groups, such as National Hot Dog and Sausage Council in the USA, encourage, sponsor, and support the events. The Council designates July as National Hot Dog Month; National Hot Dog Day varies year to year – in 2019 it falls on Wednesday, July 17 – based on when the North American Meat Institute hosts its annual Hot Dog Lunch on Capitol Hill. The council also gives advice on hot-dog eating etiquette, which aren't considered strict, as most Hot Dog Day style events do not adhere to them. A crowd at Hot Dog Day 2007. Alfred University's Howell Hall and statue of King Alfred are visible on the left. Hot Dog Day is celebrated in the spring in the village of Alfred, New York. It has been celebrated since 1971, when students first proposed it. The event is focused on the hot dog, a food popular among college students for its cheapness and ease of preparation. Hot Dog Day itself is usually the third Saturday in April, although many students celebrate the entire "hot dog week", running from that Wednesday to that Sunday. Hot Dog Day, which is organized primarily by students from Alfred University and Alfred State College, raises money for local charities and community organizations such as Alfred fire department and Alfred Montessori school. Events typically include a parade, ice cream social, "fun run", mud Olympics, hot dog eating contests, carnival, and live music. 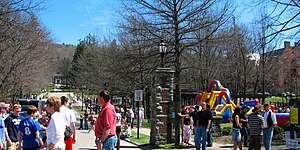 Main Street, which is closed to traffic, hosts most of these activities along with food choices such as a chicken barbecue and numerous hot dog stands. Hot Dog Day is often the time chosen for alumni reunions for Alfred's two colleges. The Annual Hot Dog Lunch in Washington, D.C., is one of the most popular social events on Capitol Hill. Sponsored by the North American Meat Institute for the past 40 years, more than 1,000 members of Congress, Administration officials, journalists and lobbyists gather in a courtyard for a huge hot dog picnic. At the lunch, hot dog companies serve their franks from traditional hot dog carts and popular retired major league baseball players sign autographs for attendees. The Boston Hot Dog Safari is an annual charity benefit founded by Boston sports radio host Eddie Andelman. The charity began in 1990 to help find a cure for cystic fibrosis by raising money for the Joey Fund, named after a friend of his who died of the disease in 1986 at the age of twelve. One of Andelman's all-time favorite foods are hot dogs, which is why the charity is called the Hot Dog Safari. The Hot Dog Safari is one of the most popular charity events in Boston today. Over the years, it has a gained a steady flow of participants as well as money for charity. In one single day, an estimated $150,000 dollars was raised to help find a cure for cystic fibrosis. Medical experts have said that finding a cure for the disease is close to being found in only a few years' time. The Safari is an all-you-eat supply of hot dogs, sausages, and ice cream sundaes. Money is earned from tickets (sold either at the door or in advance) and raffles. Entertainment is also provided. The West Virginia Hot Dog Festival has been held in Huntington, West Virginia, on the last Saturday in July since 2005. A charitable event, the festival may raise $10,000 or more for the children's cancer unit at the Edwards' Comprehensive Cancer Center. Activities include a bun run (or walk), a weiner dog race, the owner-dog look-alike contest, a car and truck show, a hotdog eating contest, and a harmonica championship. Hot dog lovers in Philadelphia, Pennsylvania, celebrate National Hotdog Month by sponsoring Hot Dog Crawls, Hot Dog Safaris & Cook Offs as well as organizing free Hot Dog lunches for Veterans and kid's summer camps during July. Leo's Lunch & Cafe, Hackettstown NJ Annual National Hot Dog Day Celebration, Free hot dogs, contests & games. ^ a b "Seven Allegany County charities share in Hot Dog Day 2007 proceeds" (Press release). Alfred University. 2008-01-08. Retrieved 2008-12-17. ^ a b "Boston Hot Dog Safari". Phantom Gourmet. Retrieved 21 December 2008. ^ "National Hot Dog Month Planning Guide". National Hot Dog and Sausage Council. 2016. Retrieved 6 July 2016. ^ North American Meat Institute (July 23, 2013). "Is Today National Hot Dog Day? A Look at the Hot Dog Day Mystery". Retrieved 2016-07-07. ^ "Hot Dog Day". Archives and Special Collections: Herrick Memorial Library. Herrick Memorial Library at Alfred University. Archived from the original on 2010-06-19. Retrieved 2008-12-17. ^ "NAMI's Annual Hot Dog Lunch Hits it Out of the Park: NHDSC Announces Hot Dog Bumper Sticker Contest Winner" (Press release). Washington, DC: North American Meat Institute. July 22, 2015. Retrieved 2016-07-07. ^ "On National Hot Dog Day, vendors offer many ways to celebrate". Newburyport News. Archived from the original on 6 September 2012. Retrieved 21 December 2008. ^ "Hotdog Day feeds 1,000 homeless". Asian Pacific Post. April 9, 2008. Archived from the original on July 18, 2011. Retrieved 21 December 2008. ^ "National Hotdog Month in Philly". This page was last edited on 28 March 2019, at 14:22 (UTC).